In vertebrates, the major histocompatibility complex (MHC) is the prime candidate for pathogen resistance genes and contains some of the most polymorphic functional loci [11, 12]. The exceptional level of MHC polymorphism is believed to be driven by the antagonistic coevolution with pathogens and occurs through pathogen-mediated balancing selection [11, 12]. Beyond its clear significance in modulating pathogen resistance [2, 13, 14], MHC genes have been shown to influence other biological traits such as maternal-fetal interactions, kin recognition, life-time reproductive success and mate choice [15–18]. MHC is intimately linked with factors likely to affect individual fitness, population viability and evolutionary potential in changing environments. Thus, patterns of MHC diversity have been repeatedly used in a conservation context in populations of particular interest [19–22]. In Europe, abundance and distribution of large carnivores (bear, wolf and lynx) have been dramatically shaped by humans during the past few centuries. Although persecuted and driven to or close to extirpation in several countries, most of the remnant populations have stabilized or even expanded recently . One example is the Iberian wolf (Canis lupus), which erstwhile ranged over most of the Iberian Peninsula, but after decades of severe human persecution became confined to small and fragmented populations, representing about 1/5 of the former population range [23–25]. In the 1970s, the Iberian wolf population was estimated to be reduced to ca. 700 individuals, mostly restricted to the northwestern region [23, 26, 27]. After the 1970s, the population started to grow and expanded southwards and eastwards (Fig. 1) . Currently, the Iberian wolf is considered under a stable or positive demographic trend . It occurs in a core area where the species have always persisted in northwestern Iberia [26, 27, 29], and the adjacent re-colonized area (the expansion front), alongside two small and isolated populations [30–32]. Such a complex demographic history have translated into a cryptic population structure in the Iberian wolf at small spatial scales, with moderate level of genetic differentiation, including the differentiation of the re-colonized area . Remarkable MHC class II variability has been shown in wolf populations [34–37]. However, results vary regarding the predominant role of selection over neutral forces. Some studies provided evidence that wolf MHC diversity is maintained by balancing selection, including studies on populations under demographic decline [34, 36], where parasite resistance was suggested as the possible driving force . In contrast, MHC diversity in the bottlenecked wolf population of Scandinavia was shown to be compatible with neutral evolution . Although MHC variability patterns of small and isolated populations may differ from that in large and outbred populations, the power of balancing selection acting on MHC can be outweighed by demographic events, such as bottlenecks and fragmentation with consequent genetic drift [38, 39]. Hence the signature of selection and/or population demographic effects is expected to vary across populations under different demographic histories, challenging the assessment of the relative role of different microevolutionary forces . This is the first report of MHC class II diversity in the Iberian wolf. 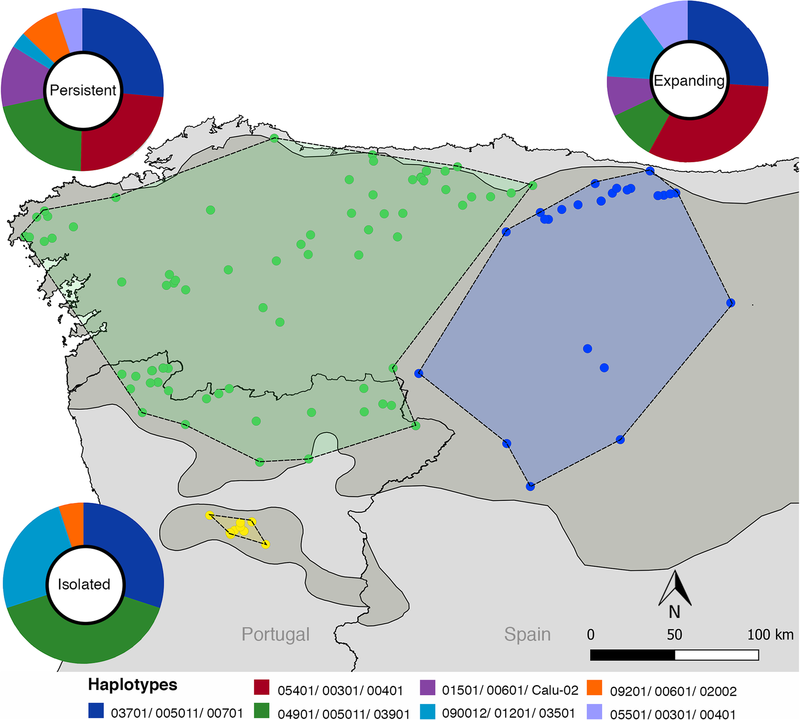 Overall, Iberian wolves exhibit lower MHC diversity than their European counterparts, both in number of alleles and number of three-locus haplotypes (i.e., 6–7 alleles and 7 haplotypes in Iberia vs 6–13 alleles and 13–14 haplotypes in other European populations) [34–36]. The exception is the isolated Scandinavian wolf population, which went through a drastic bottleneck recovering from only three individuals . The reduced MHC diversity in the Iberian wolf has also been observed for other genomic regions [31, 43–45]. Long-term isolation and past bottlenecks in the Iberian population [27, 45] have certainly reduced neutral diversity and may also be at the origin of this depleted MHC diversity. All MHC alleles have been previously identified in other canids [37, 46, 47], a pattern that is better explained by the trans-species polymorphism described in MHC canid phylogenies [37, 48] than by hybridization which is not common in the Iberian wolf . The observed 17 alleles were confined in just seven three-locus haplotypes of which five have previously been reported [34–36, 48]. The remaining two haplotypes were not unequivocal confirmed to be present in other wolf populations due to the absence of haplotype reconstruction in . The occurrence of conserved three-locus MHC haplotypes in Iberian wolves confirms the tight linkage of these gene loci, supporting a strong selective pressure maintaining haplotype combinations. The association observed between each DRB1 allele and a specific DQ pair supports the preferential association between alleles at these loci . A similar trend is observed in other European wolf population [34–36], though not as extreme as in Iberia, where seven DRB1 alleles yielded only seven haplotypes. 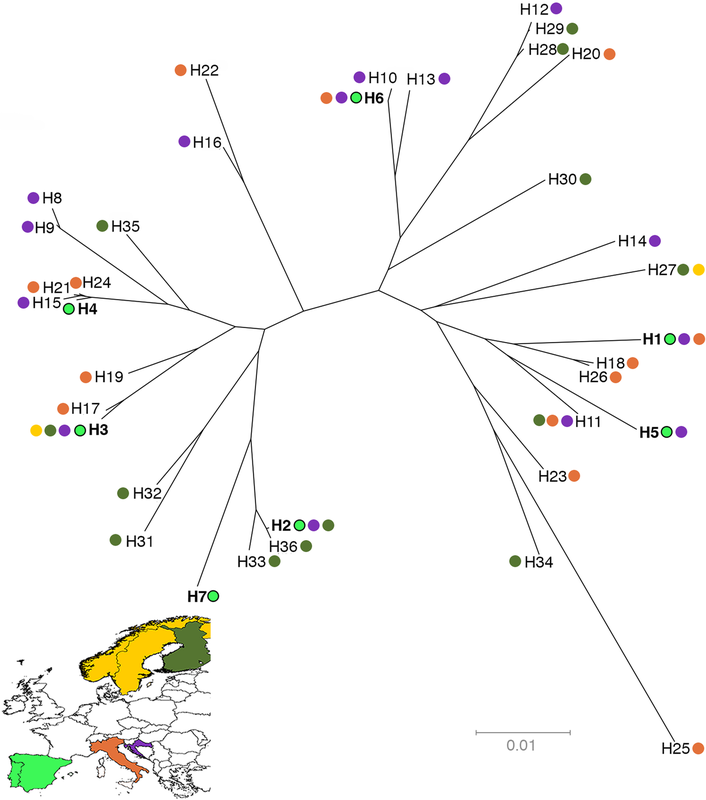 However, similarly to other European populations, the seven haplotypes are widely distributed in the NJ tree, supporting maximal MHC diversity in the Iberian wolf. The expanding group exhibited similar genetic diversity than the persistent group but show significant excess of MHC heterozygotes. Reduced genetic diversity is expected for marginal populations [10, 54–56], but increased heterozygosity at MHC supports a model of heterozygote advantage for this demographic group. The positive and significant result for neutrality statistics provides further evidence for balancing selection acting in this demographic group. The overdominance model postulates that heterozygotes have higher fitness than homozygotes due to the wider spectrum of MHC receptors able to induce parasite resistance . MHC heterozygotes have indeed been associated with resistance to several infections in wolves . Thus, the high MHC genetic diversity exhibited by the expanding group is expected to maintain its high adaptive potential. 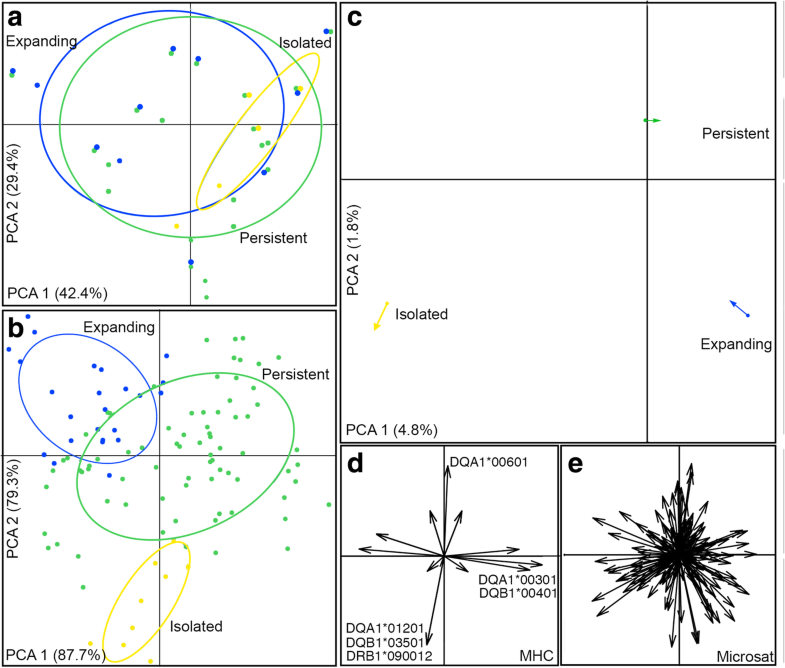 The isolated group showed the lowest neutral and adaptive diversity and no significant excess of MHC heterozygotes, a likely result of the dramatic population decline that culminated in isolation in the early twenty-first century [26, 30]. The observed depletion of MHC diversity potentially increases population susceptibility to disease, and adds to current concern for its survival [12, 57]. Indeed, in a wolf serologic survey the isolated group showed no canine parvovirus antibodies, possibly related to high case-fatality rate . No significant departure from neutrality neither significant difference between MHC and neutral loci were observed, suggesting that MHC loci behave according to neutral expectations in the isolated group. Other examples are known for small and isolated populations where genetic drift outweighs the strength of selection [3, 38, 39]. However, one interesting result comparing the isolated group with the others may suggest selective forces acting in this group. The higher Jost’s D differentiation index observed for MHC relative to neutral loci may be explained by diversifying selection as consequence of spatial variation in pathogen-mediated responses  and/or due to stronger divergence due to short-term positive selection on beneficial alleles. Interestingly, the isolated wolf population shares several pathogens with wild and domestic species [59–61], but holds also new pathogens , which could be associated with the observed differentiation in MHC. Inconclusive results are probably due to the small sample size of this group and should be interpreted with caution . Molecular divergence analysis over all sequence pairs, also either in each locus or each group (with the three-locus haplotypes) was conducted using Mega 7  with a 1000 replicate bootstrap procedure. The best nucleotide and amino acid substitution models were chosen according to the Bayesian Information Criterion and used to compute nucleotide and amino acid evolutionary distances by the maximum-likelihood method through 1000 bootstrap replicates. The relationship between three-locus haplotypes of Iberian and other European wolf populations was reconstructed using the Neighbor Joining (NJ) method and p-distances in Mega 7. Three-locus haplotypes of other European wolf populations were retrieved from previous studies [34–36, 38].